Born as one of 12 children in 1797, Sojourner Truth lived as a slave with her family until her master sold her for $100 along with a flock of sheep at nine years old. Her new owner, John Neely, was violent. Though Truth escaped her abusive owner, new masters bought and sold her twice more until she found residence working for John Dumont in West Park, New York. There, Truth learned to speak English. In 1815 Truth fell in love with a slave named Robert from a nearby plantation. Despite Robert’s slave owner forbidding the relationship, he and Truth had a child, Diana. After the birth of their daughter, Truth and Robert never saw each other again. Years later, Truth’s master forced her to marry and bear children with another slave, and Truth gave birth to a son and two daughters. When the state of New York emancipated slaves in 1827, Truth’s master refused to honor his promise to emancipate her. Thus, Truth fled with her infant daughter, leaving her other daughter and son behind. Her son, Peter, was sold to a tenant in Alabama illegally. Truth took the issue to court and won her son back to freedom, becoming one of the first black women to win a court against a white man. On June 1, 1843 Truth began her fight for the abolition of slavery. Later in 1844 Truth joined a community which lived self-sufficiently on 500 acres of land. Founded by abolitionists, the Northampton Association of Education and Industry in Northampton, Massachusetts supported a wide range of social reforms including women’s rights. There, Truth met several other abolitionists including William Lloyd Garrison, Frederick Douglass and David Ruggles. In 1846 the community disbanded, but Truth continued the movement individually. In 1851 Truth delivered the improvised speech that gained popularity and intensified the movement. While the speech, titled “Ain’t I a Woman,” was directed at gaining women’s rights, it also highlighted the conditions in which women of color faced daily. 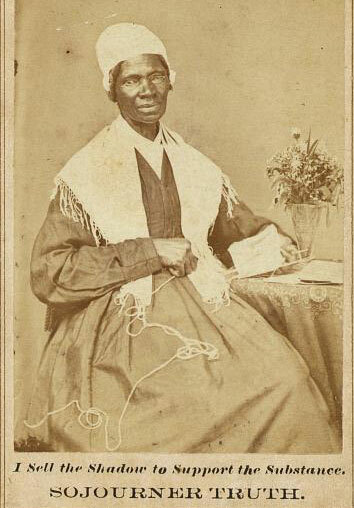 Truth gained a reputation as she continued on tour to speak for abolitionists, and was one of only a few escaped slaves along with Frederick Douglass and Harriet Tubman to rise to great nobility. Q: What impact did you think Sojourner Truth’s speech had at the time? A: Just because you’re a different race doesn’t mean you have to be treated differently. Q: How can Truth’s legend still be felt today? A: People today still feel that white women get treated better than black women. A: Black History Month means to me that all races come together as one and also everyone should be treated the same because everyone is unique. that ‘twixt the negroes of the South and the women of the North, all talking about rights, the white men will be in a fix pretty soon. But what’s all this here talking about? none but Jesus heard me! And ain’t I a woman? have my little half measure-full? come from? From God and a woman! Man had nothing to do with Him. alone, these women together ought to be able to turn it back, and get it right side up again! And now they is asking to do it, the men better let them.